Perhaps cracker making has become more of a lost skill than bread baking, and yet, to make homemade crackers is one of the easiest and least time intensive forms of baking. Like the taste of a vegetable from the garden, the simplicity and freshness of a cracker from a home kitchen is a humble pleasure, and one that need not be forgotten–or never experienced. 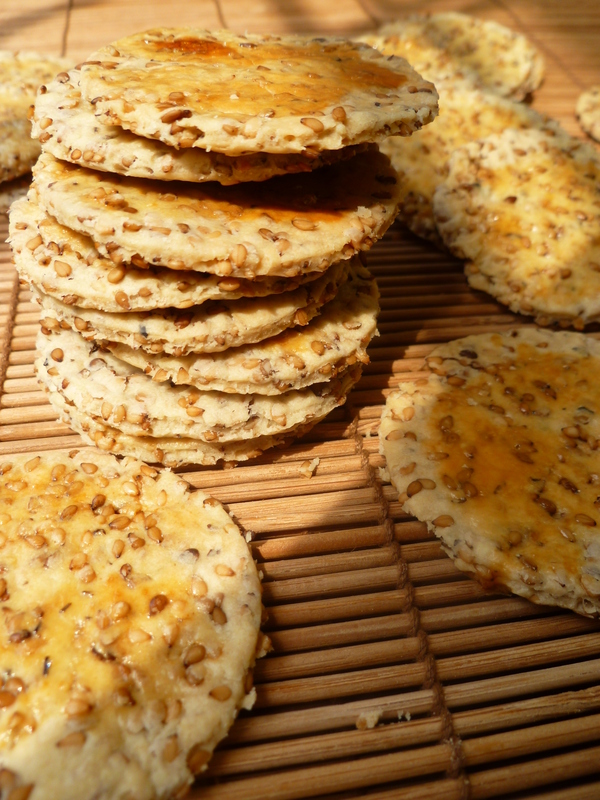 Benne (also known as Sesame) Seed Cocktail Crackers are a fine way to reintroduce cracker making into home kitchens. The little wafers are uncomplicated in the making and plain purely good to eat–either with cheese, pâté, a dip, or all by themselves. 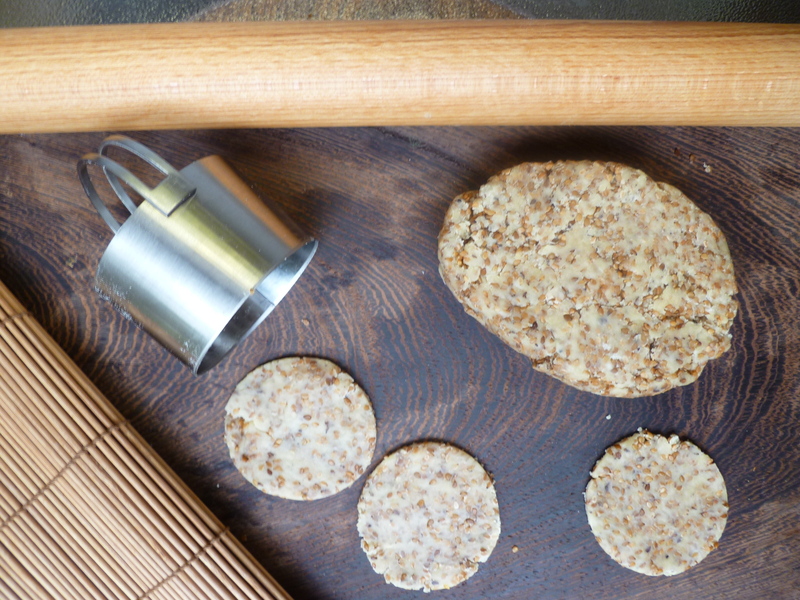 a Food Processor is an option for mixing the dough and one was used to make the photographed crackers. The directions below describe both how to make the dough with a processor and by hand. a Biscuit Cutter : with the round, 2 and 1/4-inch sized one used to cut the pictured crackers the recipe makes a few less than 3 dozen. 2. 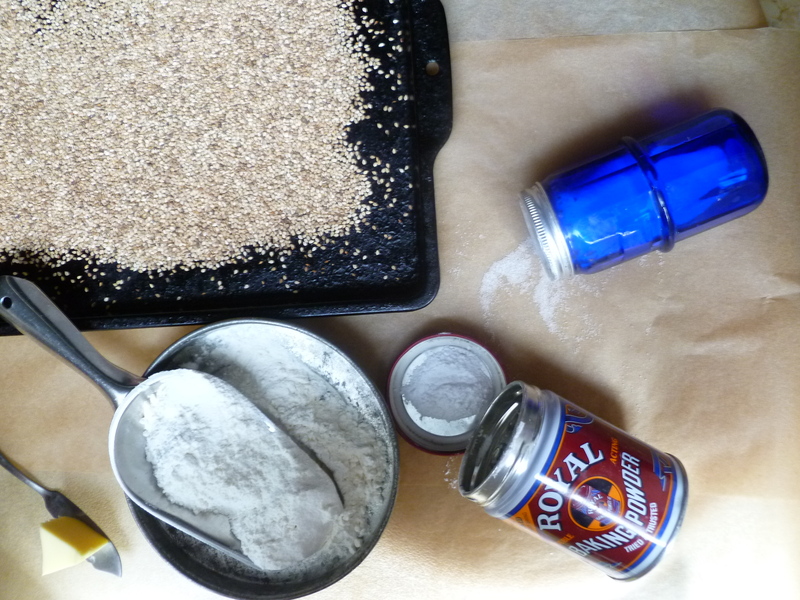 Pour the sesame seeds out onto the rimmed baking pan and toast them in a single layer until they are golden–for, perhaps, 10 minutes. Cool them completely. 3. If you are using a Food Processor, sift together the flour, baking powder and salt onto a sheet of waxed paper and pour the sifted mixture into the Processor. Cut the cold butter into bits, add it to the dry ingredients and pulse until the butter is well incorporated into the dry ingredients and the mixture becomes ‘mealy-looking’. If making the dough by hand, sift the flour, baking powder and salt directly into the mixing bowl and rub the cold bits of butter into the dry ingredients with your fingers until the mixture becomes fine-textured like cornmeal. 5. If the dough has been mixed in the Processor, transfer it to a bowl. Add the toasted sesame seeds and mix them in with your hands, roughly squeezing the dough and kneading in the seeds until they are distributed throughout the dough. (The dough may be made up to this point a day or two in advance, wrapped and chilled. Chilled dough will require a little time to sit at room temperature and soften before rolling out and cutting. 6. Sprinkle a little flour on the pastry board. Divide the dough in half. Roll out the first half as thinly as possible: “a sesame seed thick.” The dough is easy to work since it isn’t sticky and will roll out into a very thin sheet. 7. 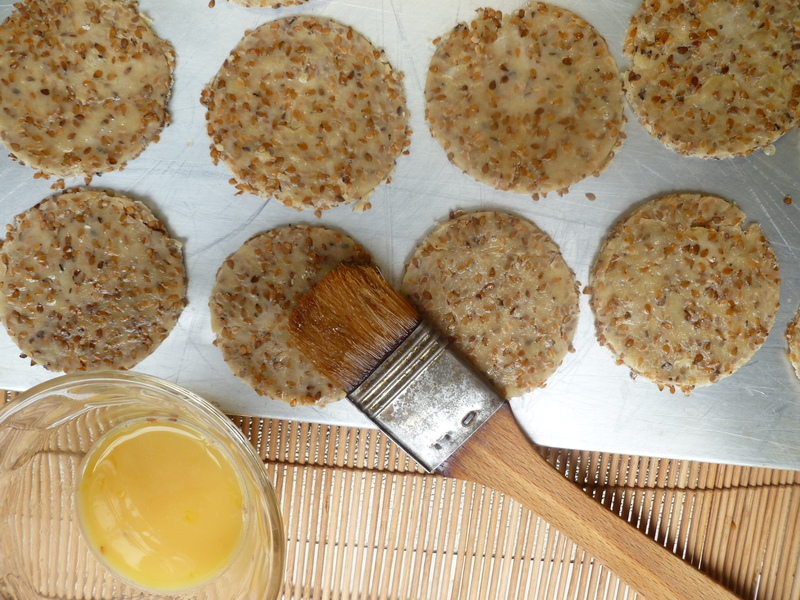 Cut rounds from the dough with the biscuit cutter. Place them on an ungreased baking sheet. In the same way, roll out the second half of the dough and cut rounds. Gather up the scraps, re-roll them into a sheet, and cut more rounds. 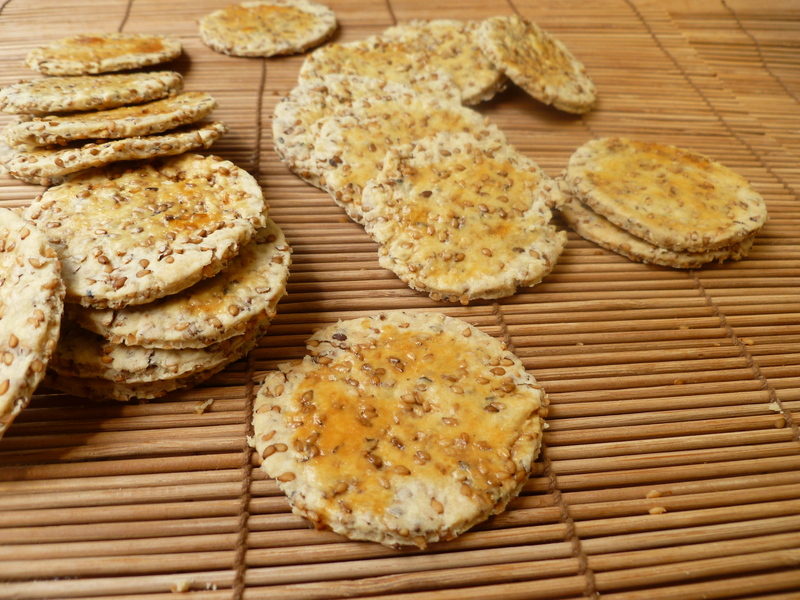 Continue making crackers until all the dough is used. …and bake them until they are golden. A reasonable estimate is 12 – 15 minutes of baking. 9. Cool the crackers on a rack. Store them in an air-tight container if they aren’t used on the day of baking. 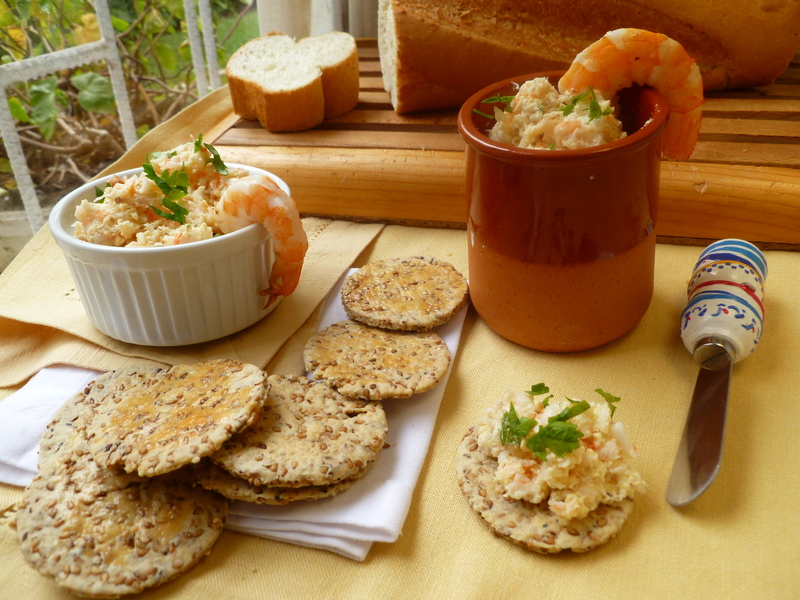 A Note: Benne (Sesame) Seed Cocktail Crackers are served before dinner in the Dinner Menu: A Lowcountry Dinner. A Second Note: You are invited….to try out ‘All Good Things’–a new feature on the diplomatickitchen. All Good Things is a forum in which to publish your contributions to good cooking.. Click on the new feature here or in the Menu at the top of the page and use the easy form to share a recipe with other readers. 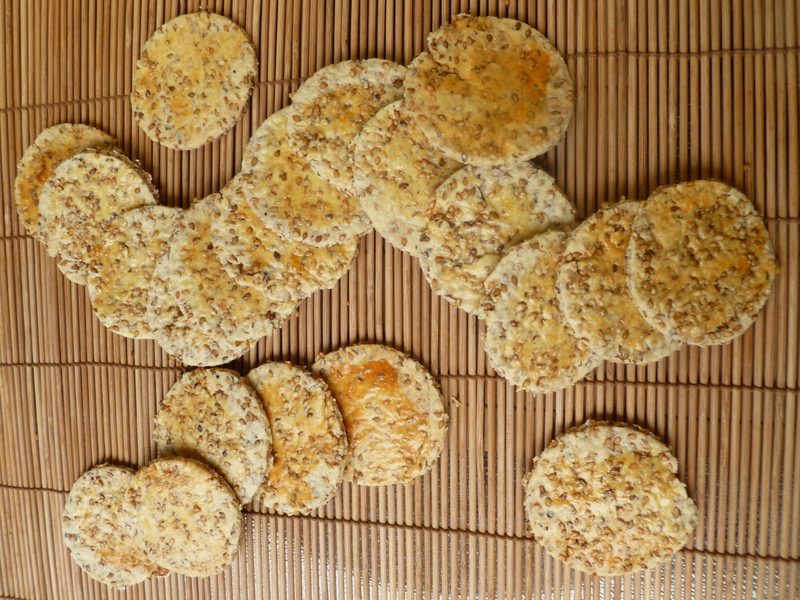 An Acknowledgement: Benne (Sesame) Seed Cocktail Crackers is adapted from Mr. Rick McDaniel’s recipe for Benne Wafers on his site Chef Rick’s Southern Cooking. Mr. McDaniel is a journalist and food historian. He is the author of An Irresistable History of Southern Food (2011), portions of which may be read here online at GoogleBooks. Mr McDaniel’s site, Chef Rick’s Southern Cooking at www.chefrick.com is a good introduction to different styles of cooking in the American South.